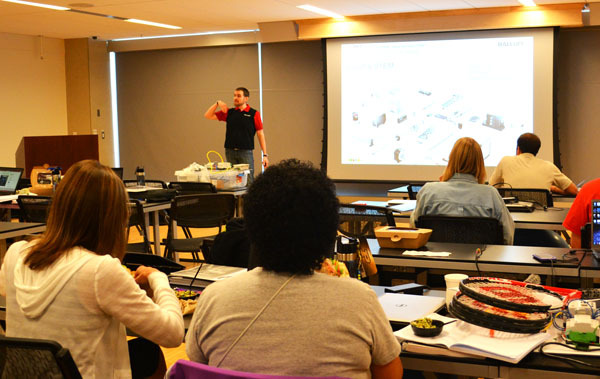 Balluff donates sensors and speaks at TECHFIT workshop designed for increasing students’ interest in science, technology, engineering and mathematics. 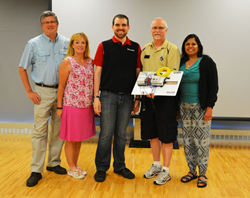 College of Charleston’s Michael and Susan Flynn, Balluff’s Will Healy III, and Purdue University’s Brad and Alka Harriger posing together at the 2014 TECHFIT workshop at Purdue University in Indiana. “Looking to the future of manufacturing, we need skilled and excited people for automation. This demands that we encourage and invest in STEM (Science, Technology, Engineering and Math) programs at schools to help develop the next generation of manufacturing,” says Will Healy III, Strategic Marketing Manager for Balluff Inc. Learn more about Balluff at http://www.balluff.us. Will Healy III of Balluff, Inc. training teachers at the TECHFIT 2014 workshop at Purdue University on July 17th 2014.